The new generation of Xiegu products, Xiegu XPA125, with a built-in antenna tuner, can amplifies the output up to 125W. This power amplifier features temperature protection, overcurrent protection, input and output detection, high and low level selectable, PA/ATU switchable. Besides, it also combine LC antenna tuner; If work with Xiegu 108G or X5105, the band and launch automatic control can be achieved with the AlC function. 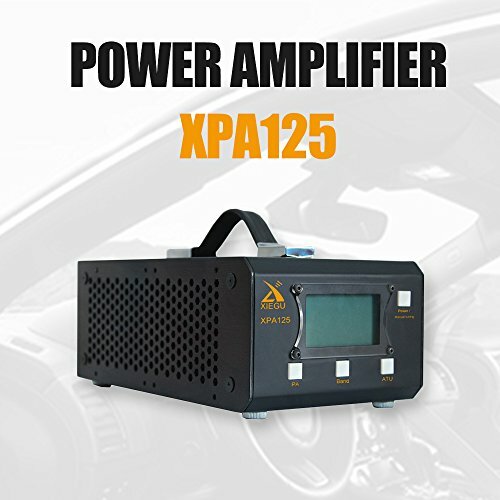 ✔ 125W OUTPUT: Xiegu XPA125 power amplifier features high output power up to 125W; Amplified Frequency Range: 0.5~50MHz. ✔ BUILT-IN ANTENNA TUNER: Xiegu XPA125 is equipped with a built-in antenna tuner, can achieve auto tuning function, precise and fast. Tuning Frequency Range: 1.8M~30M. ✔ PERFECT PROTECTION FUNCRION: Various protections including inputs and outputs, over-current, over-temperature (via active/passive heat radiation design). ✔ PERFECT EXTERNAL INTERFACE: With all the interfaces you may need (output, power, safety socket, ground, serial port communication interface, TX signal input and ACC communication interface), Xiegu XPA125 can be connected with most other QRP models to achive power amplication effect. ✔ NOTE: After XPA125 amd X108G connection, the band and launch automatic control can be achieved, and it is with the AlC function.